The comm crackled to life, “Give me 89 500 credits worth of cargo if you want to live.” The pilot of the assault ship made his demand. In all honesty it was a trivial amount when compared against the hundreds of tons of metal currently in the hold. Three tons of platinum would probably cover it, but the Commander’s mind had already been made up, and two multicannon turrets were already emerging from Type-Mine’s dorsal hardpoints. The dropship had not yet closed the distance or made any demands, possibly waiting to see how this would play out. Still clinging to the hope that he would be able to take them down one at a time, Cmdr. Vithigar gave his trigger the brief squeeze necessary to signal the automated turrets that it was time to do their thing. The sound of the twin multicannons springing to life could be faintly heard in the cockpit through the intervening fifty metres of vacuum and bulkheads. An oddly distant, muffled sound, carried to the cockpit mostly by the ship’s own hull. A blue glow wrapped the assault ship as the barrage of metal slammed into it’s shields while it manoeuvred to respond with its own armament. Flak cannons and pulse lasers returned fire on the Type-Mine, prompting the green shimmering barrier of Type-Mine’s own prismatic shields to appear. The two exchanged fire, and while the assault ship was many times more maneuverable than the Type-Mine, the generous firing arc of the dorsal turrets made it easy to keep the assault ship under fire almost continuously. Taking a quick look at the scanner Vithigar was pleased to see that the assault ship’s shields were dropping faster than his own, and the dropship had not yet closed to engage. This might work out after all. Just as the assault ship’s shield was about to collapse, the dropship finally made its move. White hot plasma slammed into the side of Type-Mine’s shield, almost completely depleting them in a single salvo, with a second round following shortly to finish the job. “Cargo theft in progress” was dutifully announced by the ship’s COVAS system, Archer, in its always calm and level voice, as a hatchbreaker drone attached itself to the underside of the ship. It was time to go. Vithigar retracted his weapons in preparation for the jump to safety as the frame shift drive began its charge cycle. A quick, low energy jump to in-system FTL speeds was faster, and these ships weren’t large enough to disrupt the charge sequence with their mass. Now it became a race between two countdowns. The time to fully charge the drive, and the time the hull would hold together. It was close. Much closer than anyone would’ve preferred, but he made it out alive and with most of his cargo intact. Looking over the manifest again Vithigar assessed how much had been lost to the little hatchbreaker. One ton of osmium, one ton of palladium, and… two unprogrammed limpet drones. So little as to be almost comical. Type-Mine’s hull was in less amusing shape. According to the damage readouts she was sitting at seven percent hull integrity. A particularly rough emergency stop could tear the ship to pieces at this point. Getting back to The Oracle, ASAP, where he could repair and offload his cargo, was now of utmost priority. Two hyperspace jumps later Type-Mine arrived in Pleiades Sector IR-W d1-55. A quick glance at the sensor scope showed a clear system. Odd, especially in light of Aegis’s call for material delivery, but not impossible, and a welcome sight for a gravely damaged ship. Commander Vithigar set off across the system toward The Oracle, the docking bay of the Orbis starport a safe harbour mere minutes away. A voice came in over the comm. Now that was really strange, where was it coming from if there were no ships in the system. Vithigar flipped the comm switch and replied. “No.” A Type-9 mining ship with a load of cargo and hull barely holding together would do well not to take any chances. Type-Mine would be stopping for no one. Still no contact on the sensors. The comm signal had a digital signature of another Pilots Federation Commander, like Vithigar himself. Unfortunately this wasn’t a good sign. Status as a Commander in the Pilots Federation was more an indicator of an adherence to a spacefaring lifestyle and the economic means to purchase your own ship than it was any kind of indicator of allegiance. This pilot was more of a wildcard, and potentially more dangerous, than any typical pirate. There was no further communication from the other Commander, but very shortly after came their very clear response in the form of an interdiction tether. Type-Mine was in no condition to tolerate the kind of strain that fighting a interdiction could cause, so Vithigar quickly cut speed and submitted to the attempt to pull him out of supercruise, dropping into realspace. The ship’s computer had managed to identify the assailant as they appeared in space next to each other. A smaller ship, the Type-7 Transporter, ostensibly the moderately lighter cargo carrying sibling of the Type-9, but this one outfitted for combat. A wolf in sheep’s clothing, most likely, intended to lure other traders into a false sense of security and make them easier targets. It was not as heavily armed as a dedicated combat vessel, but in the Type-Mine’s damaged state, that barely mattered. When the attacking ship once again failed to appear on sensors Vithigar suddenly realised why the system had appeared oddly empty when he arrived. The scuffle with the pirates back at HIP 19054 had damaged his sensors. He was blind to any ships more than a few meters away. The pilot of the Type-7 made no demands, and offered no terms. They simply opened fire immediately upon arrival in realspace. 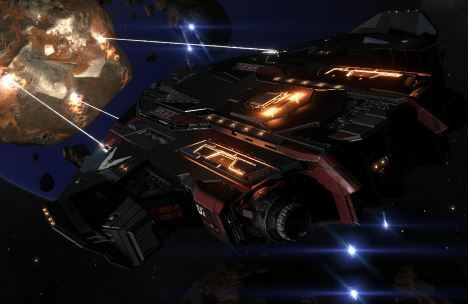 As the Type-7’s weapons began stripping the Type-Mine’s shield there was only one possible course of action. Get out, now. A low energy jump to in-system supercruise wouldn’t do it this time. An attacking Commander would likely be much more persistent than a couple of random pirates. Vithigar quickly jammed the keys on his navigation panel and targeted the nearest star, HR 1185, 11.5 light-years away. It’ll do. Anything in range will do. It felt like forever. Waiting for the frame shift drive to cool down, only to charge up again for the hyperspace jump over an agonising eternity. The prismatic shields appeared a solid green under the constant fire from the pursuing Type-7. As the blue rings on the shield status display quickly dimmed and disappeared one by one, Vithigar could do nothing except try to tough it out. Type-Mine was not even close to being agile enough to attempt to evade incoming fire. The only option was to push as much power as possible into the shields… and wait. It felt like forever. It was actually only twenty-one seconds. In a sudden flash of light and release of energy Type-Mine ripped open space itself and disappeared. Vithigar made a mental note to thank Lei Cheung for the modifications he made to the shield generator next time he was in the area. Looking at the single dull red ring left on the shield strength indicator they were most certainly now responsible for his survival and escape. Taking a moment to calm down and run a quick self diagnostic and repair on the ship’s systems, Vithigar got the sensors operating at some modicum of usefulness, enough to at least see other ships this time, and prepared to jump back and try once again to reach The Oracle. Now the scope filled with the familiar dots indicating the presence of other ships. Keeping an eye to his sensors Vithigar made his was carefully back to The Oracle, watching for any ships that seemed to be trying to get behind him. Dropping into realspace next to the station at last, Vithigar requested docking for Type-Mine, and got ready to unload his hold full of metal, but this time to the intended recipient.